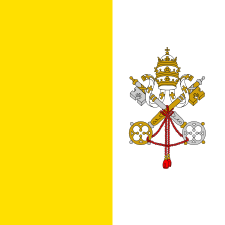 Pope Benedict VII (Latin: Benedictus VII; died 10 July 983) was Pope from October 974 to his death in 983. Benedict was born in Rome, the son of David or Deodatus (brother of Alberic II of Spoleto). 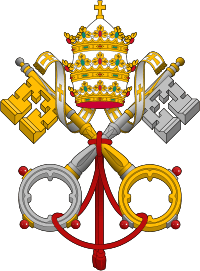 Before his election to the papacy, he had previously served as Bishop of Sutri. He belonged to the noble family of the Counts of Tusculum. He was elected by the Roman clergy and people in October 974 under the influence of Sicco, imperial envoy of Emperor Otto II. He governed a Rome that was uncharacteristically politically quiet. Benedict VII's date of birth is not known with certainty, but it is known that he was related to Prince Alberic II and connected to the Crescenti family. 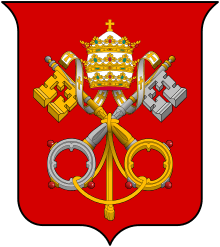 He succeeded to the papacy as a compromise candidate to replace antipope Boniface VII (974, 984–985). Boniface VII was excommunicated and unsuccessfully did not retake the papacy. Benedict VII promoted monasticism and ecclesiastical reform along with Emperor Otto II. He also consecrated the priest James, who had been sent to him by the people of Carthage "to help the wretched province of Africa," which since the Muslim conquest of the Maghreb, had seen a steep decline in the number of bishops. Benedict VII visited the city of Orvieto with his nephew Filippo Alberici, who later settled there and became consul of the city in 1016. In 978 Benedict issued a bull defining the boundaries of the diocese of Vic for bishop Froia, thereby rescinding the bulls issued by Pope John XIII that had made Vic an archdiocese. In March 981, Benedict presided over a synod in St Peter's that prohibited simony. In September 981, he convened a Lateran Synod. ↑ Herbermann, Charles, ed. (1913). "Pope Benedict VII". Catholic Encyclopedia. New York: Robert Appleton Company. ↑ Philip Zaleski (30 Nov 2010). The Best Spiritual Writing 2011. Penguin. ISBN 9781101478127. At the time of the Arab conquest there were more than three hundred bishops in the area, but by the tenth century Pope Benedict VII could not find three bishops to consecrate a new bishop.